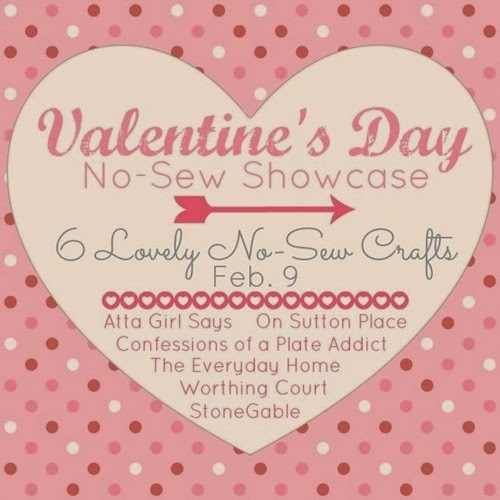 I am excited to join the No-Sew Showcase for our monthly project…this time with a Valentine theme! If you follow my blog, you know how I love tea towels and I am always envious of those fabulous vintage French linens with wonderful handwork! Well, I am going to let the cat out of the bag…I cannot sew a stitch when it comes to handwork…no needlepoint, no cross stitch, no quilting…nothing! Yikes! And what makes it even worse is that I come from a long line of mountain women who quilt! I have always wanted to learn to cross stitch, and maybe one day I will, but in the meantime, I have created a no-sew version! 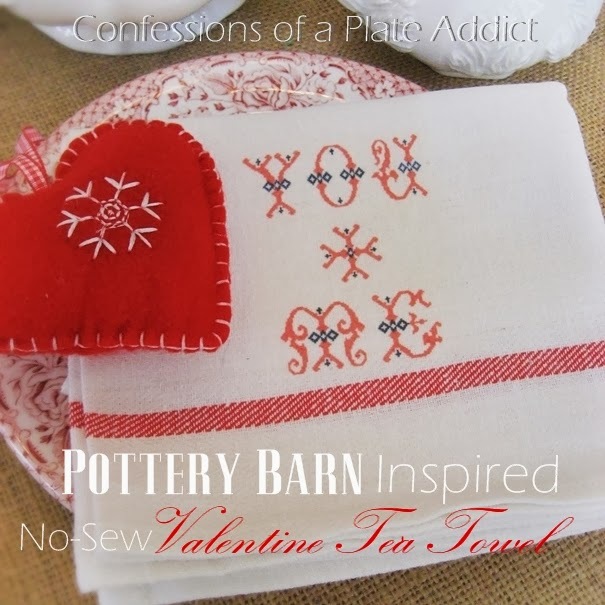 I gave you a little peek at my faux cross stitch Valentine tea towel in my vintage ironstone and sweater hearts Valentine centerpiece. If you would like a closer look, you can see it here. And here it is! I love it and it was so super-easy and inexpensive! And now I’ll share my secret…it’s really an iron-on transfer! Then all you have to do is print the cross stitch heart graphic on iron-on transfer paper and, following the directions on the package, apply it to the tea towel and you are done! Don’t you love it? It looks like I spent hours cross stitching but it only took a few minutes! …and my monogrammed vintage French linens…actually more Ikea tea towels with iron-on transfers added! …and my favorite no-sew project so far, my no-sew basket liners! Can you tell I am having a lot of fun with our no-sew group? 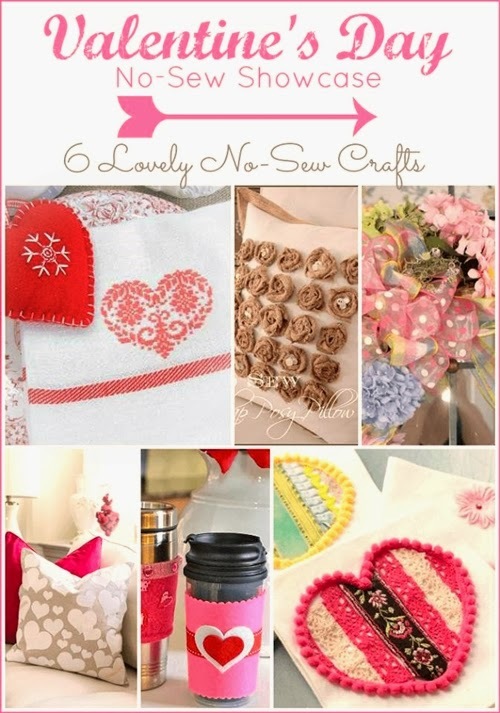 Be sure to head on over and visit the rest of the no-sew gang to see what they are up to! Worthing Court... Two No-Sew, No-Knit Cup Cozies. Thanks for stopping by! I hope you enjoyed seeing my faux cross stitch Valentine tea towel! Please visit these wonderful bloggers and their beautiful blogs to see what they are up to and to find a list of this week’s participants! I'm giving this post an A+ . . . thank you for sharing these fabulous ideas. Debbie, this is way too cute to be legal! Debbie, Even in your close-up picture I could not tell that it wasn't cross-stitched! Amazing and so beautiful! It really has an Old World french look. Perfect with your cup holder and other little hearts along with red transferware! I would love to live near you! You are one creative girl! Adorable!! Love the cross-stitched look! The sweater wreath is sweet too! You come up with the most clever ideas! That is really cute, and looks like a perfect match to the stripe on the towel. I love to cross stitch, but there are times when I need a gift NOW, and this would be just the thing. It's been ages since I've cross stitched. I can do it, but I wonder if my eyesight is up to it anymore. And no need when you can get some amazing results with an iron-on transfer and in a fraction of the time. I never pass up those Ikea tea towels. At 79 cents, they're a steal and so versatile. As always, your no-sew project rocks!